Rallying is one of the oldest and most popular forms of motor sport in the world. A team of driver and co-driver hurtle down closed public roads on a variety of surfaces in rally cars ranging from the mildly modified Group N cars to the outrageous 300 bhp All Wheel Drive, $500,000 WRC cars. Unlike some other forms of racing, the team competes against the clock at 1 minute intervals - and the fastest time wins! These competitive sections or "Special Stages" are linked together by public road sections called "liaisons" where the team obeys normal traffic laws but must reach the next Special Stage right on time - not a minute early or minute late. Depending on the terrain and country, Special Stages can involve high speed driving on twisting and turning dirt, gravel, snow, ice and asphalt roads. Frequently cars are airborne and they are always sliding as the drivers set the cars up for corner after corner - often with no previous reconnaissance and only the skill of the co-drivers map reading to help them. What is a Rally School? To be a successful rally driver you must be skilled at controlling your car when confronted with all types of road surface. You must be prepared to handle loose gravel, standing water, hairpin turns, "blind" crests and lots more. Unlike racing, many of these skills have an everyday application in being a controlled, safe driver as well as a fast one! What type of car will I drive? Beginners taking a one-day rally course drive a 2WD, while students in multiday advanced programs also drive 4WD vehicles. All the cars used have a standard (manual) transmission. Available models include Mitsubishi Lancers and Suburu Imprezas. The minimum age to participate in the course is 18. You must also possess a valid driver's license. Where is the driving school? 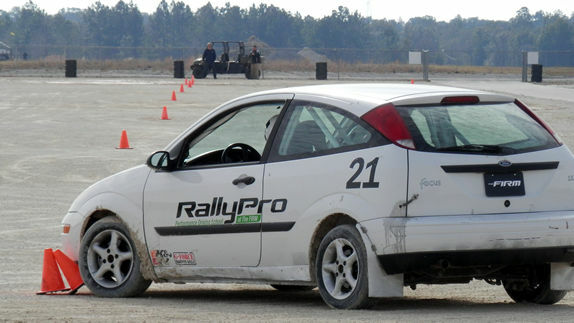 The RallyPro Driving School is located in Starke, Florida, approximately 25 minutes northeast of Gainesville and 90 minutes from Orlando. The nearest commercial airport is in Gainesville. Private and corporate planes fly into Keystone Heights Airpark, adjacent to the driving school. How many driving tracks (stages) are there? What is the price range for driving courses? The cost ranges from $870 to $6000, depending on the number of days, group size and type of car. Classes range in length from one to five days. Are there other activities at the school? Yes. The facility also features a Karts Course and an ATV course. An SUV driving course is also offered. Are there facilities for corporate groups? Yes. We can easily accommodate groups of 3 to 75. There are three classroom/meeting rooms on site. There is also a small swimming pool for visitor use. Catering arrangements can be made upon request.